Great Lakes Books Series, 9780814335987, 220pp. The focus of the opening campaign of the War of 1812 was Detroit, a location the War Department considered one of the significant launching points for the invasion of Canada. Detroit's surrender only two months after the declaration of war shocked the nation and led to the court-martial of Brigadier General William Hull. Hull was sentenced to death-the only commanding general ever to receive such a sentence in U.S. military history-and has been vilified by many historians to the present day for his decision to surrender. 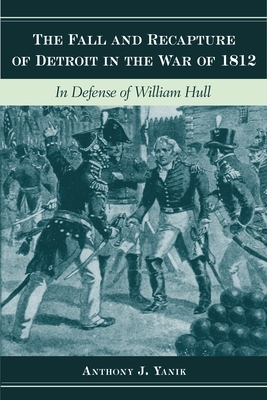 In The Fall and Recapture of Detroit in the War of 1812: In Defense of William Hull, author Anthony J. Yanik reconsiders Hull's abrupt surrender and the general's defense that the decision was based on sound humanitarian grounds. Yanik begins by tracing the political roots of the War of 1812 and giving readers an idea of what life was like in the tiny frontier settlement of Detroit in the years leading up to the war. He moves on to Hull's appointment as brigadier general and the assembly of the North Western Army in the summer of 1812, culminating in their arduous journey to Detroit and botched invasion of Canada. Yanik then details Hull's surrender and its repercussions for Detroit, including life under British rule and the eventual recapture of Detroit by American forces. Yanik also probes the general's court-martial for cowardice in 1814, arguing that a close examination of the testimony of the witnesses, an analysis of Hull's defense, and a review of the actual events themselves raise many questions about the credibility of the verdict that was issued. Including a chronology of Hull's Detroit campaign and appendixes with historical writings and speeches from the officials involved in the war effort, The Fall and Recapture of Detroit in the War of 1812 will be enjoyable reading for military and local historians, just in time for the upcoming bicentennial anniversary of the War of 1812. Anthony Yanik is a General Motors retiree with a background in speech writing, among other assignments. His previous book, Maxwell Motor and the Making of Chrysler Corporation (Wayne State University Press, 2009) received the Michigan Historical Society's prestigious State History Award. He is also the author of The E-M-F Company: The Story of Automotive Pioneers Barney Everitt, William Metzger, and Walter Flanders and editor of The Birth of Chrysler Corporation and Its Engineering Legacy.